It's Joffrey's name day, the Westeros equivalent of a birthday, so everyone has to entertain the tyrant. Ser Dontos Hollard is about to get the King's wrath in the form of an execution until Sansa intervenes and suggests he'd make a better fool. Fortunately for Ser Dontos, Joffrey likes this idea, and the knight escapes with his life thanks to Sansa, something that he won't forget. Tyrion, finally arrived back in King's Landing, arrives just in time for the "festivities." Joffrey flips out when his uncle offers his condolences to Sansa over her father's death. Cersei seems to be enjoying being in charge as Queen Regent when Tyrion rains all over her Small Council meeting. It seems she didn't know about Tyrion's temporary appointment as Hand of the King. Until this very instant. Tyrion calls Cersei on her bungling of the Stark hostages; instead of having three to exchange for Jaime, they only have Sansa. At Winterfell, Bran, as lord, is listening to a petitioner complain about not having anyone to repair his walls because all the men are gone, fighting for Robb. Poor Bran has the weight of being the Stark in Winterfell on his shoulders. Later he dreams of seeing through Summer's eyes—or was it a dream? The next day in the godswood, he talks to Osha about the red comet he also saw, and she says it's a sign of dragons. Speaking of Dragons . . . .
Daenerys and what's left of her khalasar are roaming a desert wasteland. Her poor horse, the one Drogo gave her as a wedding gift, collapses and dies. Jorah reminds her that their destinations are limited because they can't defend themselves. Daenerys sends her bloodriders out in different directions to try and find a city and then report back. It's the first appearance of Dolorous Edd of the Night's Watch! I love that guy and his droll wit. The Night's Watch is crashing at Craster's Keep on their way further north, but the place isn't exactly a five star hotel. First of all, Craster's wives are also his daughters. EEEWWWWWWWWW. That aside, the man is just gross. Mormont asks Craster if Benjen stopped by recently, but he has not. Mormont does learn that the Wildlings are joining up with Mance Rayder, once a man of the Night's Watch and now the self-crowned King Beyond the Wall. 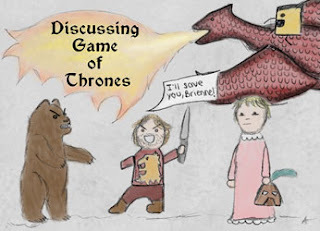 Craster takes an instant dislike to Jon, who gets a little too sassy with his host and then gets a reprimand from Mormont once they're outside. We're introduced to some new characters and a new setting: Dragonstone, where Melisandre, a priestess of the Lord of Light, is overseeing the burning of the statues of the seven gods, much to the horror of the maester at Dragonstone. Maester Cressen urges Ser Davos Seaworth, advisor to Stannis Baratheon, to talk to Stannis about what a crazy biatch Melisandre is. In the war room, we immediately learn how stony, blunt, and totally devoid of charm Stannis is. Poor Maester Cressen attempts to poison Melisandre, but he ends up dying instead. Despite still being Robb's prisoner, Jaime hasn't lost his arrogance or smartass-ness. He does look a little antsy when Grey Wind meanders into his makeshift cell, however. Robb confronts him with the truth about Joffrey's parentage, which Stannis has just mass raven-ed across Westeros, and informs Jaime of his plan to send a Lannister cousin/messenger to King's Landing with his peace terms. Cersei brings some guards with her to have a quick chat with Littlefinger about Arya's whereabouts. Cersei being Cersei, she needles him about an unrequited love of his, clearly meaning Catelyn Stark. In retaliation, Littlefinger alludes to the twincest, which crosses a line that almost gets him killed. Cersei wants him to make it his business to find Arya. Robb dictates his peace terms to Alton Lannister: the return of his sisters and his father's body, and independence for the North. Theon tells Robb he can't win the war without taking King's Landing and offers to return home to the Iron Islands where he'll ask his father for ships. Catelyn is not a fan of the idea because Balon Greyjoy previously rebelled against the Iron Throne and Ned put an end to it, taking young Theon back to Winterfell as insurance against future trouble. Catelyn wants to go home, but Robb is sending her to negotiate with Renly Baratheon. Joffrey is checking out the renovations to the throne room when his mother walks in. She wants Joffrey to send men to find Arya so they can get Jaime back. That prompts Joffrey to mention the rumor going around about his mother and uncle, and the conversation turns ugly. He demands to know how many bastards Robert fathered and insults Cersei, which earns him a slap in the face. Joffrey reminds Cersei that what she just did is punishable by death. Ros is moving up in the world and now trains the new recruits in Littlefinger's establishment. Janos Slynt and the City Watch show up at the place and kill Robert Baratheon's illegitimate baby. There's a hunt all through King's Landing for other bastards, and those that are found are also killed. Gendry is on their radar, but he's no longer in the capital; he's on his way north to the Wall as part of Yoren's group, which also includes Arya. THE NORTH REMEMBERS!! My absolute FAVORITE scene from this episode is the one where Robb confronts Jamie. Jamie tries in all his smartass glory, but Robb gets the last laugh. And it is the scene that truly convinced me that Robb was fully aware of and fully capable of controlling his wolf Grey Wind. If you'll notice that when Robb gets angry, Grey Wind begins slowly stalking Jamie's cage. Robb then tempers him and the disappears leaving Grey Wind to send Jamie a final message by snapping at his face but not actually hurting him. I suspected when GW took off the Greatjon's Fingers. But this is the scene that I was like...Robb knows the true relationship he has to his wolf and knows how to use it. Such control...loved it! Sorry I rambled so much. I love this series so much! Rambling is always welcome here, because I do it myself, lol! I can't get enough of GoT and ASoIaF! Even an ego the size of Jaime's couldn't quite withstand a direwolf right in the face. The Greatjon's comeback line after Grey Wind ripped off a few of his fingers was perfect; only this series could make me laugh at a scene like that, lol.